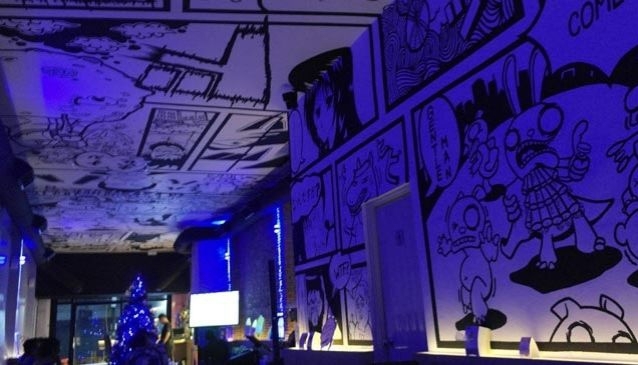 In conjunction with its name, Comics Café and Bar has cartoon character images on the walls and ceiling that have been used to decorate this funky place to eat. The large menu contains both International and Thai food with the signature dish being Comic's Salad, a western salad with spicy Thai seafood including fresh salmon. Other items worthy of note are spicy vermicelli , salad, steak, pork and spaghetti. A good drink is the Berry Mix jelly Sparkling Sake, a sweet and bubbly beverage, which has a jelly-like texture. Along with other non-alcoholic cocktails, the venu also sells alocholoic drinks such as imported beer - brands suchs as Stellar, Hoegaarden, Leffe and Duvel - as well as spirits. In the evening, there's live music from 8:30pm.